Robert Buehler, Damen Award recipient, with Father Raymond Baumhart, S.J., on June 18, 1987. 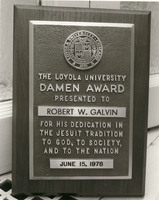 The Damen Award to Robert W. Galvin, June 15, 1978. The Camellia Award bestowed upon Patty Crowley in 1978. Colonel Henry Crown, Rev. James F. Maguire, S.J., and Mr. Howard V. Phalin at the 1972 Founders' Dinner. Phalin was presented with the Damen Award. 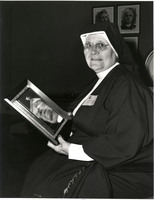 Sr. Mary Alice Rowan, D. C., recipient of the Camellia Award, 1968.